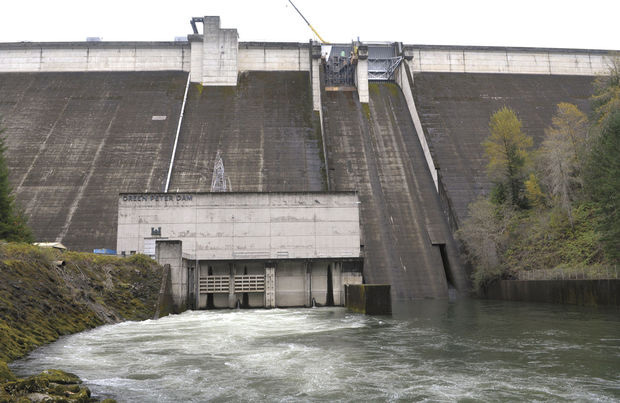 SWEET HOME — Tradesmen with Knight Construction of Deer Park, Washington, are busy refurbishing one of the two spillway gates on the 50-year-old Green Peter Dam. Scott Clemans, a spokesman for the Army Corps of Engineers, said the two-lane road that connects the the north and south shores of Green Peter Reservoir will remain closed at least through December, except for emergencies. The project is expected to be completed in February. The $3.2 million project is necessary because issues were found in the struts that hold the 48-by-45-foot gates — called tainter gates — in place and the trunnion (pivot point). The same work will be done on the dam’s second gate in 2016. and is estimated to cost another $3 million.